Elvis Presley sings more of my favorite love songs than any other singer. 2. Have I told you lately that I love you? One time a guy was in a hospital bed, and when his wife was leaving, she asked him this question, and he wrote the song! To me this song is so fantastic. When I was a kid, I loved the drums and the back up vocals. I was a big fan of E.P. This is from the movie Jailhouse Rock, after the other man hurt his throat. I borrowed this record from a girl fan when I was a teenager, and this was one of my favorite songs by Elvis Presley. This song is also on the ‘Loving You’ movie. When I was little this was one of my favorite love songs by Elvis Presley. To me, the music and singing and everything were just so fantastic. Seeing it on the movie, I realize that it is one of his best performances. The clothes, the lighting, everything. 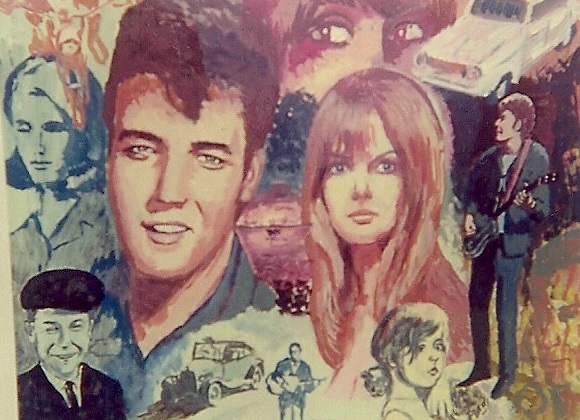 When I was at Graceland, I saw this record on the wall, and a note said that it sold 32 million copies. I love the guitar beginning of this number. When I was a teenager, this song felt so hip. That it didn’t matter if a girl was square, so long as she loved me. “You just want to park, where it’s nice and dark, and kiss and hold me tight.” This is one of my all time favorite love songs by the king: Elvis Presley. I heard this one on the radio years ago. So glad to find it on youtube. An old Bobby Darin number. Heard this one for the first time today. An old one from Olivia Newton-John. Many times I lie in bed at night and sing it silently to myself. A little while back I read the book by the same title, by Lucy de Barbin, and it is the most precious book about Elvis that I have ever read. It is so intimate and private. A real love affair. I understand now, why he looks so sad in so many of his photos. I think it is very romantic. This was a big hit when I was a teenager. This was the first Elvis movie I ever saw, and I loved the beginning as he drove his jeep down the mountain singing this song. When I sang it, I only did the last verse, and put in my own home town name in the song. This was a big hit when I was a kid, and takes me right back to my childhood. This a ‘live’ recording at the Louisiana Hayride. It is exciting to hear the crowd. This was on the flipside of his first record. I heard this one at a friends house when I was a young teenager. It felt so romantic. It brings back all those memories. The good times. A number of country singer did this one, but I like El’s version the most. I never knew he sang this song, I have just found it now by mistake. Lots of nice romantic pictures here. People and animals. This is ‘live’ at the Louisiana Hayride, back in the 50’s. I think he knew how to play on people’s heart strings. I wonder if kissing so many girls had an effect on him. I remember reading about Pat Boone not wanting to kiss any girl in a movie because he was married.